As a proud official sponsor of the Skagit Valley Tulip Festival, we can't wait to take you to the region's best attraction all throughout the month of April! Join us for a Full Day Guided Tour through Northwest Washington's Skagit Valley, which lies about 65 miles north of downtown Seattle. We will divide our day between the Tulip Festival in the morning, s stop for lunch in La Conner, more tulip viewing in the afternoon, and a stop at a winery for local wine and organic snacks before returning to Seattle. We think it would be a shame not to indulge while we're in the area! In additional to visiting two of the Skagit Valley's two top tulip viewing areas, Roozengaarge and Tulip Town, we'll stop at a local winery for a full tasting flight and local organic snacks to round out the day. 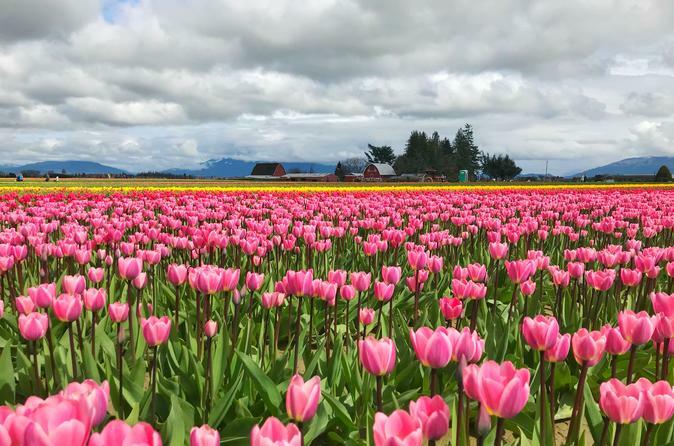 With a full day at the Tulip Festival, ample time for lunch in gorgeous seaside La Conner, and complimentary wine and food pairings in the late afternoon, there's no better way to enjoy the gorgeous Skagit Valley! Your full day small group tour of the Skagit Valley Tulip Festival, with wine and food tasting, will begin when your guide and driver picks you up at your downtown Seattle hotel in our comfortable high-roof, extended length van. As we drive north and gradually depart the city, you'll get your first glimpses of the the snow capped North Cascade mountains and Mt. Baker on clear days. After about an hour on the highway, we'll make our way along the Skagit Valley's back roads and get our first glimpses of fields of daffodils and tulips stretching before us. Your first stop of the day will be at Roozengaarde, the largest tulip producer in North America. Roozengaarde's tulip display garden is 5 acres and is planted with approximately 250,000 tulips each year. We will spend approximately 2 hours at Roozengaarde before proceeding on to the historic seaside village of La Conner. You will have about 90 minutes to explore beautiful seaside La Conner, have lunch at one of the village's many restaurants, and enjoy a cup of coffee or tea at one the many bakeries and shops that line the waterfront. After lunch, we'll be energized and ready for more tulip viewing. This time, we'll stop into Tulip Town, the second prime tulip viewing area in the Skagit Valley. In addition to the expansive tulip viewing areas, Tulip Town also has a delightful gift shop featuring local artists' work and locally crafted keepsakes. You will have approximately 2 hours to view and enjoy the Tulip Town display area. After our stop at Tulip Town, we'll stop by a local winery where you choose to enjoy a complimentary wine tasting flight as well as a platter of locally made artisan cheeses and organic bread from a local bakery. On sunny days, you'll sit outside looking across the fields toward the mountains in the distance, enjoying local wine and snacks before our return to Seattle. Your guide (and designated driver!) will take the group back to Seattle and drop you off back at your downtown hotel. Depending on traffic, you will arrive back in Seattle at about 5:00pm to 6:00pm.